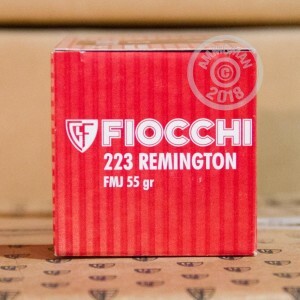 Ideal for range training and target practice, this 223 Remington Fiocchi 55 grain FMJ ammo is the perfect complement to your 223 rifle. 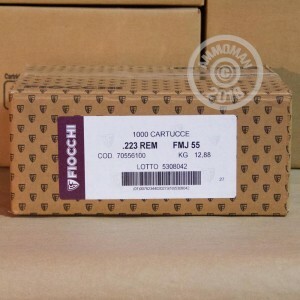 The 223 Remington 55 grain full metal jacket ammunition is a member of Fiocchi's Shooting Dynamics line of products. With high volume in mind, Fiocchi developed this line so shooters could have consistent, reliable products for an affordable price. The 55 grain full metal jacket bullet delivers accurate results one would expect from Fiocchi. 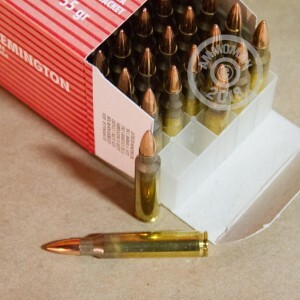 The brass cased cartridges will feed smoothly into your rifle. Boxer primers and top quality American powders go easy on your barrel, which is especially important when you're firing round after round. Fiocchi was founded in Italy in 1876 by the Fiocchi family. Fiocchi continues to attract skilled, dedicated employees with extraordinary talent. This, along with consistently delivering reliable and top of the line products, allows them to continue to be a leader in the ammunition industry. The company remains family owned today.